STEP Forward is an exciting new program this year (2017-2018) that offered STEP graduates the opportunity to extend their communications skills beyond the classroom to the general public and with policymakers. Dr. Liz Kwan asks a cute little girl to help with her DNA replication activity. In collaboration with the Pacific Science Center, STEP Forward fellows participated in the Pacific Science Center’s Science Communication Fellowship program to develop a hands-on activity related to their current research for teaching and engaging a general audience. STEP Forward fellows completed their intensive 2-day communication training at the Pacific Science Center in this past November (2017). In addition to prototyping and developing activities that highlight fellows’ research, they developed effective skills in communicating science with public audiences. 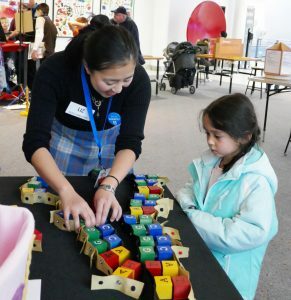 Since December 2017, STEP Forward fellows has showcased their activities at PacSci’s “Meet a Scientist” events as well as additional public events. 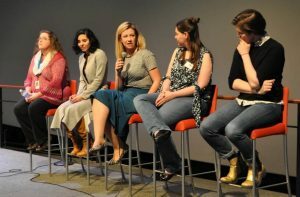 Several STEP Forward fellows participated in PacSci’s storytelling workshop and the “Science in the City” event for 21+ audiences that focuses on the lives of scientists. STEP Forward Fellows Dr. Parisa Hosseinzadeh, Dr. Karla-Luise Herpoldt, and Dr. Amy Stone on the panel in PacSci’s “Science in the City” series. Several STEP Forward fellows presented a poster on their activity at UW Teaching and Learning Symposium on April 17th, 2018. You can read more about it here. In addition to working with the public through events at the Pacific Science Center, fellows will receive training and opportunities to present to local policymakers (coming up in June! ), and mentorship on preparing their activity or teaching materials for publication. STEP Forward is funded by a Career Guidance for Trainees grant from the Burroughs Wellcome Fund.